Don't miss out on this amazing deal Avalon Magic Plants offers you! Choose 3 spore syringes (20 ML) of our best selling strains below. You can't get these syringes cheaper anywhere! Excellent product! Came in 20ml syringes instead of 10ml :D and arrived a lot quicker than expected so much so I couldn’t figure out what was being delivered when I got a text saying they’d be here next day! Will definitely be using you guys again. You made the purchase process so easy and streamlined and answered all my questions promptly. I ordered these a while ago, they arrived rather quickly. What was in the box was really nice, there was a70% Isopropyl desinfecting cloth. 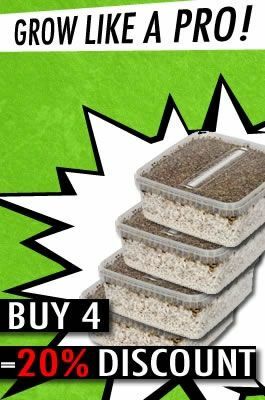 I also ordered a liter of Vermiculite to get started cultivating. I'm doing this review now because I wanted to see the results of my first ever home grown mushrooms. I was a bit disappointed, i went through the complete incubation process as sterile as possible, desinfected the needle twice with the Isopropyl and a lighter until it was glowing red (I obviously let it cool for a few minutes before further incubating) but my first 2 rice cakes still got contaminated and grew moldy. I have my second set of 1/2 pint jars currently in the process, and I'm hoping to see better results this time around. But I can't really say if the syringes themselves we contaminated or I somehow messed up along the process, so just rest assured that your order will ship quickly, discreetly and on time. I got 3 syringes and mine where 20 CC each :) !! There were no needles attached, and they resended those immediately, gotta love them!